This collection contain 4 products which to me aren’t very christmassy but i understand the inspiration behind the collection. The Fatale Palette (£34.00)– consists of 4 powder eyeshadows which are all shimmery which is a new thing for Illamasqua. The colours are Bronx a Bronze gold, Ensnare a Sultry Berry Shimmer- this totally reminds me of MAC Cranberry but not as dark, Mystify a Chestnut Brown Shimmer. 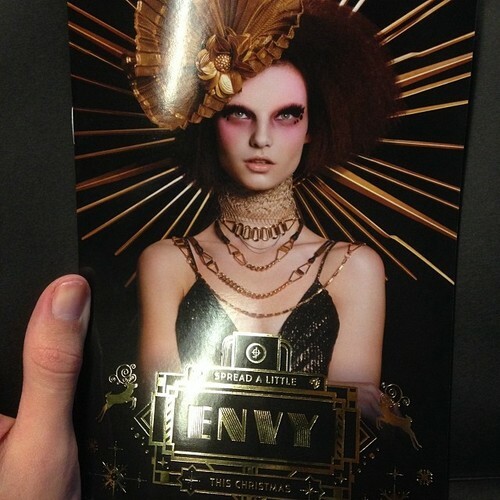 What do you think of Envy? I love the look of that pallet! I absolutely love Illamasqua. Those eye shadows look gorgeous. I’m more of a neutrals girl for eye shadow but this quad looks very pretty! Oooh such a pretty lovely palette. Beautiful shades. It would be great if the palette has more color choices ! !